Avoiding meat and dairy products is one of the biggest ways to reduce your environmental impact, according to recent scientific studies. But what is the difference between beef and chicken? Does a bowl of rice produce more climate warming greenhouse gases than a plate of chips? Is wine more environmentally friendly than beer? To find out the climate impact of what you eat and drink, choose from one of the 34 items in our calculator and pick how often you have it. Don't cry because you can't play with our interactive. Which food would you like? How often do you have it? All figures for each food in the calculator are global averages. If you cannot view the food calculator, click to launch the interactive content. Design by Prina Shah, development by Felix Stephenson and Becky Rush. However, the researchers found that the environmental impact of different foods varies hugely. Their findings showed that meat and other animal products are responsible for more than half of food-related greenhouse gas emissions, despite providing only a fifth of the calories we eat and drink. Of all the products analysed in the study, beef and lamb were found to have by far the most damaging effect on the environment. The findings echo recommendations on how individuals can lessen climate change by the Intergovernmental Panel on Climate Change (IPCC). 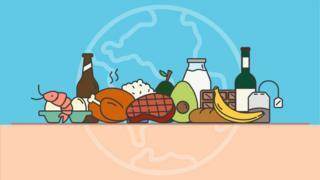 When it comes to our diets, the IPCC says we need to buy less meat, milk, cheese and butter - but also eat more locally sourced seasonal food, and throw less of it away. The IPCC also recommends that we insulate homes, take trains and buses instead of planes, and use video conferencing instead of business travel. Cutting meat and dairy products from your diet could reduce an individual's carbon footprint from food by two-thirds, according to the Oxford study, published in the journal Science. "What we eat is one of the most powerful drivers behind most of the world's major environmental issues, whether it's climate change or biodiversity loss," study researcher Joseph Poore told BBC News. Changing your diet can make a big difference to your personal environmental footprint, from saving water to reducing pollution and the loss of forests, he said. "It reduces the amount of land required to produce your food by about 75% - that's a huge reduction, particularly if you scale that up globally," Poore explained. If you fly regularly, replacing flying with other forms of transport may have a bigger impact on your carbon footprint than changing your diet. A passenger's carbon footprint from a one-way flight from London to New York is just under half a tonne of greenhouse gases. Switching from a regular petrol vehicle to an electric car could save more than double that over a year. Knowing how and where your food is produced is also important, as the same food can have huge differences in environmental impact. For example, beef cattle raised on deforested land is responsible for 12 times more greenhouse gas emissions than cows reared on natural pastures. The average beef from South America results in three times the amount of greenhouse gases as beef produced in Europe - and uses 10 times as much land. Meat and dairy are not the only foods where the choices you make can make a big difference. Chocolate and coffee originating from deforested rainforest produce relatively high greenhouse gases. For climate-friendly tomatoes, choose those grown outdoors or in high-tech greenhouses, instead of in greenhouses heated by gas or oil. Environmentally-minded beer-drinkers may be interested to know that draught beer is responsible for fewer emissions than recyclable cans, or worse, glass bottles. Even the most climate-friendly meat options still produce more greenhouse gases than vegetarian protein sources, like beans or nuts. How did we make the calculator? How is the environmental impact calculated? University of Oxford researcher Joseph Poore, and Thomas Nemecek of the Agroecology and Environment Research Division in Zurich, Switzerland, looked at the environmental impact of 40 major food products that represent the vast majority of what is eaten globally. They assessed the effect of these foods on climate-warming greenhouse gas emissions and the amount of land and fresh water used across all stages of their production, including processing, packaging, and transportation, but excluding the cooking process. By analysing data from nearly 40,000 farms, 1,600 processors, packaging types and retailers, Poore and Nemecek were able to assess how different production practices and geographies have very different consequences on the planet. The data in the study looked at the environmental impact for 1kg of each of the different food products. For this story, these were converted to impact per serving sizes based on serving sizes from the British Dietetic Association (BDA) and healthy diet portion sizes from BUPA. The figures for serving sizes based on the BDA and BUPA suggestions are often lower than portion sizes commonly found in restaurants and what people normally expect, so the figures returned by the calculator on the impact of individuals' consumption are likely to be higher in reality. Protein-rich foods were calculated using the impact per 100g of protein from Poore and Nemecek's research and data on protein per serving from the BDA, to avoid differences between cooked and uncooked foods. The figures for greenhouse gas emissions are in kilograms of carbon dioxide equivalents (CO2eq). This is a unit that converts the impact of different kinds of greenhouse gases, like methane and nitrous oxide, to the equivalent amount of carbon dioxide. How do you know what my diet is equal to in miles driven? The annual impact from eating a specific food is calculated by multiplying the impact of one serving of that food by the times it is eaten in a year, based on the weekly estimates submitted by the user. These are then compared with the emissions of other daily habits. The European Environment Agency estimates that driving a regular petrol car produces 392g of CO2eq/mile over its entire lifecycle, including emissions from the vehicle's production, fuel production and exhaust emissions per mile. Heating the average UK home produces 2.34 tonnes of CO2eq annually, according to data from the Committee on Climate Change, and a passenger's carbon footprint for a return flight from London to Malaga is 320kg CO2eq, based on figures from the Carbon Neutral calculator. The land used to produce the annual consumption of each food is compared with the size of a double tennis court, 261 metres squared. The annual amount of water used is compared with a shower, based on figures suggesting the average shower lasts eight minutes and uses up 65 litres. Only "blue water", i.e. water taken out of rivers or the ground, is included in the data.